We've all heard it before: Python is slow. When I teach courses on Python for scientific computing, I make this point very early in the course, and tell the students why: it boils down to Python being a dynamically typed, interpreted language, where values are stored not in dense buffers but in scattered objects. And then I talk about how to get around this by using NumPy, SciPy, and related tools for vectorization of operations and calling into compiled code, and go on from there. But I realized something recently: despite the relative accuracy of the above statements, the words "dynamically-typed-interpreted-buffers-vectorization-compiled" probably mean very little to somebody attending an intro programming seminar. The jargon does little to enlighten people about what's actually going on "under the hood", so to speak. So I decided I would write this post, and dive into the details that I usually gloss over. Along the way, we'll take a look at using Python's standard library to introspect the goings-on of CPython itself. So whether you're a novice or experienced programmer, I hope you'll learn something from the following exploration. For a variable in C, the compiler knows the type by its very definition. For a variable in Python, all you know at the time the program executes is that it's some sort of Python object. 3f. result of this is result, and is an integer. The dynamic typing means that there are a lot more steps involved with any operation. This is a primary reason that Python is slow compared to C for operations on numerical data. We saw above one difference between interpreted and compiled code. A smart compiler can look ahead and optimize for repeated or unneeded operations, which can result in speed-ups. Compiler optimization is its own beast, and I'm personally not qualified to say much about it, so I'll stop there. For some examples of this in action, you can take a look at my previous post on Numba and Cython. We saw above the extra type info layer when moving from a C integer to a Python integer. Now imagine you have many such integers and want to do some sort of batch operation on them. In Python you might use the standard List object, while in C you would likely use some sort of buffer-based array. It's easy to see that if you're doing some operation which steps through data in sequence, the numpy layout will be much more efficient than the Python layout, both in the cost of storage and the cost of access. Given this inherent inefficiency, why would we even think about using Python? Well, it comes down to this: Dynamic typing makes Python easier to use than C. It's extremely flexible and forgiving, this flexibility leads to efficient use of development time, and on those occasions that you really need the optimization of C or Fortran, Python offers easy hooks into compiled libraries. It's why Python use within many scientific communities has been continually growing. With all that put together, Python ends up being an extremely efficient language for the overall task of doing science with code. Above I've talked about some of the internal structures that make Python tick, but I don't want to stop there. 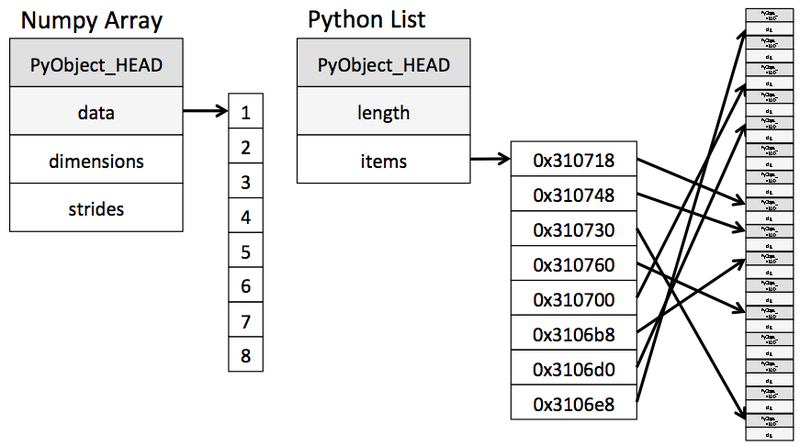 As I was putting together the above summary, I started hacking around on the internals of the Python language, and found that the process itself is pretty enlightening. In the following sections, I'm going to prove to you that the above information is correct, by doing some hacking to expose Python objects using Python itself. Please note that everything below is written using Python 3.4. Earlier versions of Python have a slightly different internal object structure, and later versions may tweak this further. Please make sure to use the correct version! Also, most of the code below assumes a 64-bit CPU. If you're on a 32-bit platform, some of the C types below will have to be adjusted to account for this difference. But the simplicity of this interface belies the complexity of what is happening under the hood. We briefly discussed the memory layout of Python integers above. Here we'll use Python's built-in ctypes module to introspect Python's integer type from the Python interpreter itself. But first we need to know exactly what a Python integer looks like at the level of the C API. here _PyObject_HEAD_EXTRA is a macro which is not normally used in the Python build. The ob_refcnt variable is the reference count for the object, the ob_type variable is a pointer to the structure containing all the type information and method definitions for the object, and the ob_digit holds the actual numerical value. Armed with this knowledge, we'll use the ctypes module to start looking into the actual object structure and extract some of the above information. The ob_digit attribute points to the correct location in memory! But what about refcount? We've only created a single value: why is the reference count so much greater than one? We see that zero is referenced several thousand times, and as you may expect, the frequency of references generally decreases as the value of the integer increases. If you go a bit deeper into this, you might notice that this does not hold for numbers larger than 256: it turns out that some bit-shift gymnastics are performed in Objects/longobject.c, and these change the way large integers are represented in memory. Here the PyObject **ob_item is what points to the contents of the list, and the ob_size value tells us how many items are in the list. Now let's see about finding the actual elements within the list. We've recovered the PyObject integers within our list! You might wish to take a moment to look back up to the schematic of the List memory layout above, and make sure you understand how these ctypes operations map onto that diagram. Note that I'm using NumPy version 1.8 here; these internals may have changed between versions, though I'm not sure whether this is the case. Now we can do the tricky part of pulling out the data buffer. For simplicity we'll ignore the strides and assume it's a C-contiguous array; this could be generalized with a bit of work. ... and observe that the data view changes as well. Both x and data are pointing to the same contiguous block of memory. Comparing the internals of the Python list and the NumPy ndarray, it is clear that NumPy's arrays are much, much simpler for representing a list of identically-typed data. That fact is related to what makes it more efficient for the compiler to handle as well. Using ctypes to wrap the C-level data behind Python objects allows you to do some pretty interesting things. With proper attribution to my friend James Powell, I'll say it here: seriously, don't use this code. While nothing below should actually be used (ever), I still find it all pretty interesting! Inspired by this Reddit post, we can actually modify the numerical value of integer objects! If we use a common number like 0 or 1, we're very likely to crash our Python kernel. But if we do it with less important numbers, we can get away with it, at least briefly. # WARNNG: never do this! iptr.ob_digit = 4  # now Python's 113 contains a 4! But note now that we can't set the value back in a simple manner, because the true value 113 no longer exists in Python! Just in case I didn't stress it enough before: never do this. # WARNING: never do this! Like I said, you should never use this, and I honestly can't think of any reason why you would want to. But it gives you an idea of the types of operations the interpreter has to do when modifying the contents of a list. Compare this to the NumPy example above, and you'll see one reason why Python lists have more overhead than Python arrays. Now we'll attempt to make a structure that wraps itself. We can't do this directly, because we don't know at what address in memory the new structure will be created. But what we can do is create a second structure wrapping the first, and use this to modify its contents in-place! We now have a self-wrapping Python structure! Python is slow. And one big reason for that, as we've seen, is the type indirection under the hood which makes Python quick, easy, and fun for the developer. And as we've seen, Python itself offers tools that can be used to hack into the Python objects themselves. I hope that this was made more clear through this exploration of the differences between various objects, and some liberal mucking around in the internals of CPython itself. This exercise was extremely enlightening for me, and I hope it was for you as well... Happy hacking! This blog post was written entirely in the IPython Notebook. The full notebook can be downloaded here, or viewed statically here.